Board members presented White with flowers as well as books for her children. 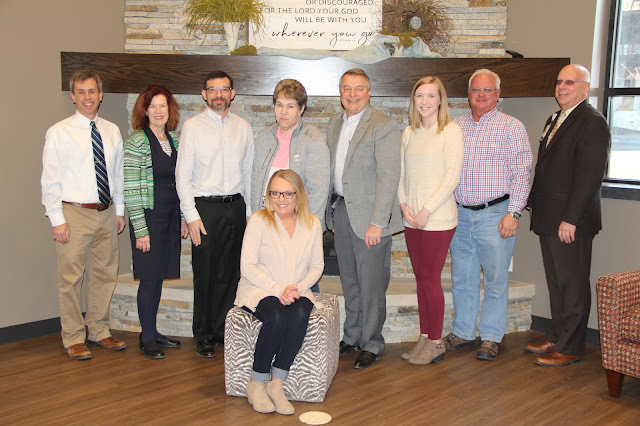 Lisa Puckett, a Habitat client who purchased her home in 2010, serves on Habitat’s Family Selection Committee and will serve as White’s family advocate during the construction process. Partner families invest hundreds of hours of “sweat equity” into building their homes and the homes of others. The houses are sold at no profit and with no interest charged. Mortgage payments are placed in a revolving fund and used to finance additional houses. Volunteers provide the labor, and individuals, churches, and corporate sponsors provide the money and materials to build Habitat houses. Habitat for Humanity of Nodaway County serves the communities of Maryville, Elmo, Clearmont, Burlington Junction, Quitman, Skidmore, Graham, Hopkins, Pickering, Ravenwood, Clyde, Conception Junction, Conception, Arkoe, Barnard, Guilford and Parnell. Habitat for Humanity of Nodaway County is one of more than 50 affiliates and campus chapters in the state of Missouri.